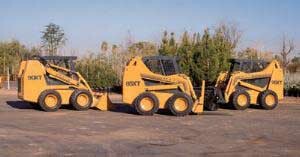 Case Corp. manufactures four 1800 Series skid steers and four heavy-lift XT models. The skid steers are available with couplers designed to allow fast, easy exchange of attachments. A high-flow kit is available for the 1840 and 1845C skid steers that can double available hydraulic flow to attachments. A 3000 psi (207 bar) high-flow hydraulic system is available for all four models of XTs, as is a 5000 psi (345 bar) hydrostatic high-flow hydraulic system to drive larger, more powerful attachments for greater productivity. The high-flow kits are engineered to improve the performance of augers, cold planers, snow blowers, stump grinders and other attachments that require rapid revolution or more hydraulic horsepower. They also make possible the use of larger, more powerful attachments. The 1825B, 1838, 1840 and 1845C skid steers range from 30 to 60 horsepower (22.4 to 44.7 kW), with rated operating loads from 885 to 1,750 pounds (401 to 793 kg). The 75XT, 85XT, 90XT and 95XT heavy-lift models range from 60 to 85 horsepower (44.7 to 63.4 kW), with rated operating loads from 2,200 to 3,150 pounds (998 to 1429 kg).